Venture for America Fellow. Detroit-dwelling Chicago native. I do biking things and writing things. I moved to Detroit in August of 2013. I’ve talked about some of my experiences here: my cautious optimism, a scary encounter with street harassment, and an extended metaphor attempting to convey the difficulties of the last year. Then there’s the million other Feelings I regularly cycle through that don’t get blogged about. So here’s the big news, news that shouldn’t be too surprising if you’ve talked to me in the last year: I’m leaving Detroit. I’d rather not have to explain why a million times over, so here’s an email I wrote to my co-curator and collaborator for Motor Signal, the poetry reading series I had a hand in starting here. It explains enough, and is more straightforward than I could be if I was writing this post from scratch. I recently returned from last weekend’s Theorizing the Web conference, which I described to people as “a sociological perspective on web and digital phenomena.” It was two days packed full of talks on everything from drones and big data to selfies and feminism online. I was particularly excited (duh) for the session titled “Streetview: space, place, and geography.” The Q&A made it into the video below, but unfortunately not the talks themselves. There’s this piece of art hanging around University of Chicago’s Booth School. 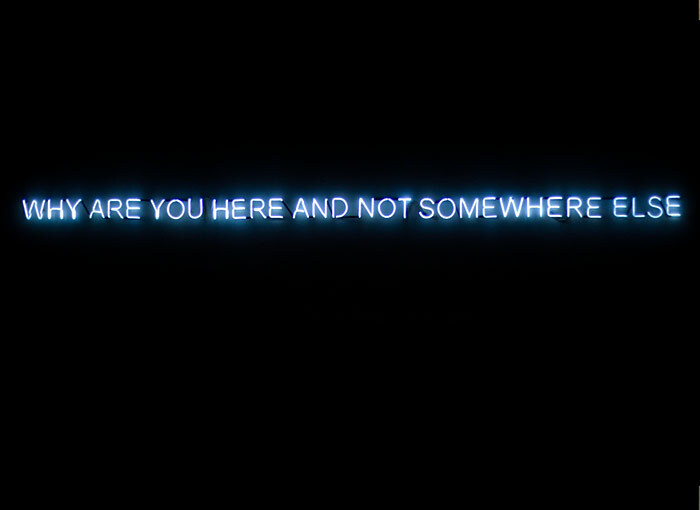 It’s a neon work by Jeppe Hein, a Danish artist, and it reads, “Why are you here and not somewhere else?” When I figured out that I was moving to Detroit. I would look up at Hein’s piece and expect some kind of epiphany, some felt realization that I’d be leaving the place I had come to call home. As much as I’d fixate on the artwork, and the question it asked, that jolt never came. When people learn I studied geography, they often bring up maps in an attempt to relate. I didn’t spend all my time making or examining maps, but they’re a crucial part of the discipline. Geography is fundamentally about place, and maps are graphic representations that help us make sense of place and pick out patterns. From the look on their faces, you’d think I’d have said that I was getting into war profiteering, or joining a cult, Kool Aid already dripping off my lips. I saw this scene play out time and time again when I told people that I would be moving from Chicago to Detroit post-graduation. Didn’t matter who–old classmates, family friends, even the dental hygienist I saw the other morning. To say nothing of my parents. If I had to describe people’s reactions to my (so-I-thought) exciting news, I’d throw out these words: Confused. Alarmed. Suspicious. Smug. Oh yeah, those last ones were the best, casually throwing a “don’t get shot” my way. Urban violence! Hilarious. I hear plenty such dismissals out-of-hand of the South Side of Chicago and they always irked me greatly. Detroit, though, is the illustrative case people raise when they’re warning of the path Chicago is heading down.